Compatible rechargeable batteries from thrid party manufacturers, specialised on such accessories. Often these replacement batteries offer the same or better capacity due to newer technology. At an often better price than the original! *Delivery without belt clip, no belt clip possible. ...the quantum leap in battery technology! Due to the low self-discharge the charged Ansmann maxE batteries are ready for use for one year. No special chargers required. maxE Batteries are sold fully charged and are ready for immediate use. Ansmann maxE batteries are available in AA sizes. Ideal for euqipment with low power consumption, for example remote controls, clocks etc. where a normal rechargeable battery with it's high self-discharge coulnd't be used before. Pre-charged, rechargeable battery! Unpack - install - use! Ready for use for one year after each charge! Check your batteries, precise and fast, PC controlled! 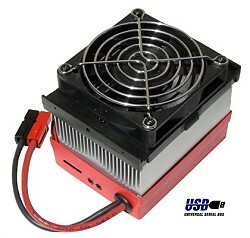 Ideal for RC controlled units, radio or other demading applications. Very useful when you need very precise information about which capacity your batteries (still) have. The CBA-IV is easily connected via USB to your computer. With the included software you select a discharge current, the internal micro processor keeps this current precisely constant over discharge time. The resulting discharge voltage is plotted over time and displayed graphically. So you can very easily see the total discharge capacity in amp/hrs. For easy comparison different results can be stored and overlaid. The CBA-IV supports most battery types: NiCD, NiMH, LiIon, Lead acid etc. Max. supported voltage is 48V, the max, discharge power can be up to 150W. Complete test results can be archived and printed for precise documentation of your batteries. Optionally sticker labels for the batteries can be printed. Plug and Play high speed USB interface, with easy to use and intuitive Windows™ software on CD ROM, works on all Windows 32+64bit platforms. Scientifically analyzes battery performance with a true constant current battery capacity test that is graphically displayed. Perform tests quickly at real world load conditions, up to 150 watts or 40 amps! High voltage testing at up to 48 volts; the equivalent of 1 to 38 NiCad or NiMh cells. 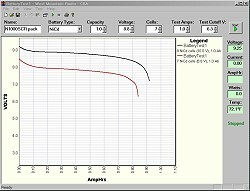 Save display and print battery test graphs and battery labels. Measures and displays voltage, current, amp/hr, watts and temperature (requires optional temp. sensor). Easy overlay comparisons of multiple graphs may be displayed saved and recalled. Test any type of battery: NiCad, NiMH, Lead Acid, Li Ion, Li Poly, Alkaline, Carbon Zinc, Mercury etc; from coin cell to automotive or larger. Accurate digital measurement of current, voltage and temperature, 10 bit resolution with three auto selected voltage ranges. On board C8051 based USB Micro controller 10 bit measurements with a precision 0.5 % high stability voltage reference. Superior, software and electronically regulated, constant current testing using a solid state FET fan cooled electronic load. Automatic test shut off at a safe pre-determined minimum battery voltage. Default shut off voltage may be used or selected by the user. Automatic test shut off at a for a pre-determined maximum battery temperature. Default shut off temperatrue may be used or selected by the user. Temperature cutoff requires our optional temperature probe. Fail safe: software and/or hardware protection of temperature, current, power and reverse polarity. Supplied with USB cable and high grade 13 gauge flexible Powerpole battery test cable. Optional adapters available for most batteries. Optional external temperature sensor provides measurement of battery temperature for complete testing. Maximum test rate: 150 watts or 40 amps, whichever is higher. Discharge test current user selectable from .5 to 40 Amps.